July 26 is International Mangrove Day, dedicated to the unique forests that survive at the interface of land, river and sea. Mangroves protect coastlines from storm surges, filter out pollutants, and are home to a wide array of diverse life. What does the disappearance of this special forest ecosystem mean for our planet? Experts respond. Sitting at the edge of land and sea, mangroves are unique in many ways. The mangrove trees and shrubs form dense forests, their special, intertwining roots helping them survive in the saline and brackish waters they call home. These forests are skilled at filtering pollutants from river water. They are adept at trapping excess sediment before it reaches the ocean. They are also carbon powerhouses, a tract of mangrove locking away many times more carbon in the soil than a similarly sized area of rainforest. Moreover, mangrove swamps are important nurseries for several fish species, and support a massive diversity of wildlife, including tigers, crocodiles, otters, turtles and several species of birds and insects. Given all that mangroves do, it is unsurprising that the forests have a special day dedicated to them: July 26, International Mangrove Day. However, mangroves have declined rapidly around the world, losing out to shrimp farms, tourist resorts, agricultural and urban land over the past decades. Tall, dense mangrove trees on the shore of Pulau Balang, Indonesia. Image by Basten Gokken/Mongabay. Without mangroves we would all be diminished and many people would suffer. It’s a dismal scenario that includes coasts with barren, unproductive shores, collapsed fisheries, turbid, polluted water, little protection for communities from severe weather events and sea level rise and loss of many types of animals and plants. It would be a world without mangrove tigers, mangrove honeyeaters, mud crabs or mangrove mud whelks. While these losses are felt most intensely by communities that have removed or degraded their mangroves, they ultimately affect all of us through reduced food security, enhanced migration, and increased potential for conflict. Losses of mangroves also release large amounts of carbon dioxide into the atmosphere, arising from destruction of their biomass and the release of the large carbon stocks held in their soils. This affects all of us on the planet as it contributes to global warming, further accelerating global climatic change. Protection and restoration of the mangroves that we have already lost or degraded should have the highest priority because of the benefits to people, biodiversity and the planet. In my country, Australia, restoring the mangroves and other coastal wetlands will benefit the iconic Great Barrier Reef, improving water quality and fisheries. In other countries where I work, for example Myanmar, conserving and restoring mangroves is critical for the health of the communities of the Irrawaddy Delta who rely on the mangrove for their livelihoods and security. If we all attend to the conservation and restoration of mangroves not only will local communities benefit, but the global community will benefit by increasing the carbon sink of the coastal zone, helping to limit global warming. Mangroves are important habitat-forming species at the interface of freshwater, marine and terrestrial ecosystems. As such, they provide a number of critical ecosystem services including protection from coastal erosion and storm damage, natural filters for pollution and sediment, carbon sequestration, and critical habitat for a wide variety of species, including nursing grounds for many coastal fishes. It is estimated that 80 percent of global fish catches are directly or indirectly dependent on mangroves. A world without mangroves would likely mean a world with fewer fishes, more coastal damage, and unknown ecosystem and public health consequences related to changes in pollutant, sediment and carbon cycles. Love them or hate them, we all depend on mangroves and tidal wetlands. They have been the quiet achievers that have somehow adapted to fit among our everyday lives. Facing the sea and bordering river and stream estuaries, these habitats offer essential services that will be sorely missed when they are further diminished. But our communities are driven by short-term gain in alternate land uses, and detrimental pollution. There appears to be little regard for the advantages provided by natural ecosystems because they have rarely been valued in our terms. After all, their services have been provided for free. Why should we now pay for these benefits? And this is the nut of the current dilemma. Tidal wetlands are highly threatened by both an expanding global footprint of human development, coupled with rapid alterations to the world’s climate. The world we live in is fast changing and the natural environments must adapt and adjust to survive! 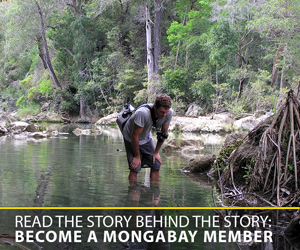 The challenge is to convince people that mangroves are useful, and healthy natural environments are good for them! One seemingly rational approach has been to give a fiscal value to natural places. But that is not easy. While we can relatively easily place a dollar value on the support and harboring of local and nearshore commercial fisheries by mangroves, what about recreational values? There are many major environmental benefits that usually go under the fiscal radar. That means we are grossly undervaluing such natural places. 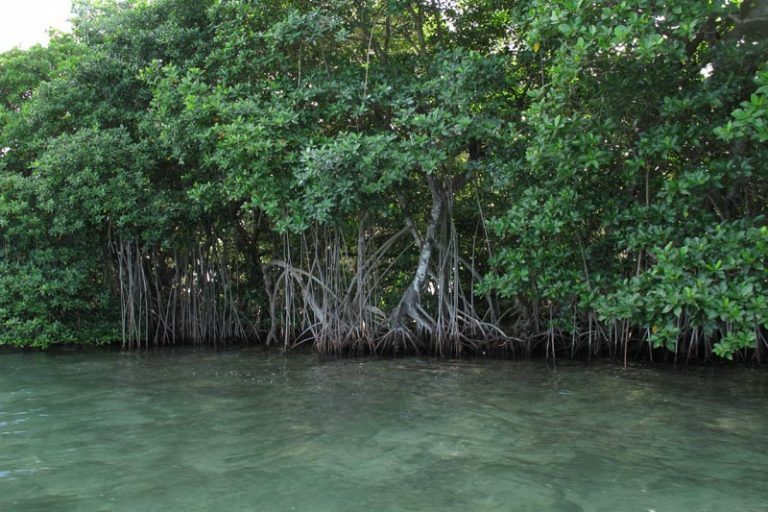 For mangroves, these benefits include shoreline protection and mitigation of waterways troubled by severe flooding and violent storms, plus their acknowledged extreme capacity to sequester carbon from the atmosphere — five greater than other forested places. And each of these things is increasingly threatened already as the climate changes. While the public perception of tidal habitats remains divided, these valuable places are rapidly being removed and damaged beyond recognition, and diminished benefits. The question is, can these habitats cope?! And is there enough time for them to adapt? Our best available evidence suggests they are not coping well! The squeeze is real, with accumulative pressures of ever-increasing human populations, resource demands and development combined with the progressive impacts of changing climate and rising sea levels. These are impacts never known on Earth before. There seems little reason for optimism! Sundarbans mangrove forest at mid-tide. Image by V. Malik via Wikimedia Commons (CC 2.0). Although mangroves are an invasive species in Hawaii where I grew up, the more I learn about them, the more I appreciate them. They are often the stepchild of marine conservation — as they are muddy and buggy and hard to maneuver in — and ownership gets confused or lost as they straddle the land and sea. But their benefits outweigh a few mosquito bites and dirty boots — from their roles as nursery habitats to coastal protection to carbon storage. Unfortunately, global mangrove loss is occurring at an alarming rate. 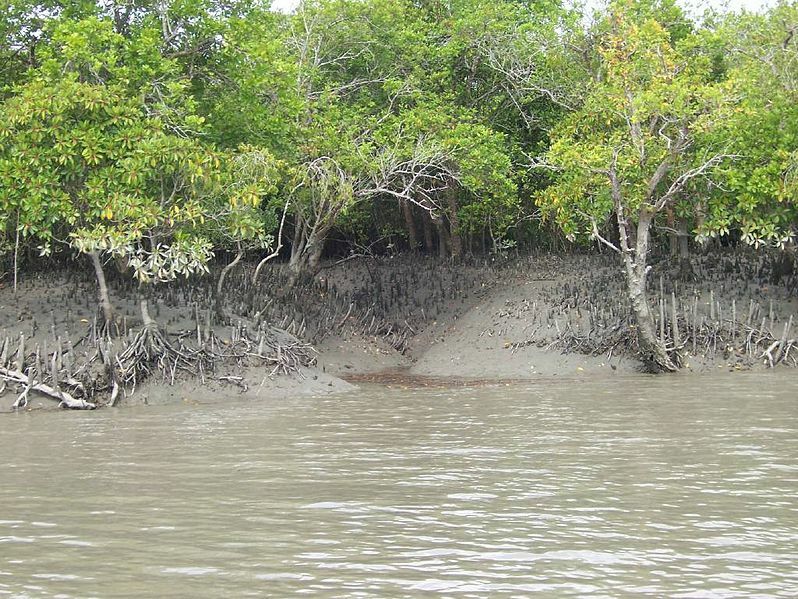 This not only has negative impacts for coastal communities and fisheries health, but also contributes disproportionally to climate change as the deep, sprawling roots of mangroves that make it hard to walk around and trap all the mud are also important for trapping carbon. I’ve been to fancy hotels on beaches for meetings that used to be mangrove forests. I’ve seen endless aquaculture ponds from airplanes — many that are no longer viable, that used to be mangrove forests. We need to do better. Of all coastal ecosystems, mangrove conservation has some of the greatest potential in terms of return on investment. While I would never argue for just conserving one type of coastal ecosystem, mangroves do provide some “easier” wins. If done right, mangrove restoration is a viable option that can be done at scale. They have higher adaptive capacity mangroves as they are less vulnerable to climate change. And the potential to include mangrove conservation in countries’ Nationally Determined Contributions (NDCs) to address climate change should be a motivator for governments. Conservation of mangroves is a sound investment, and bringing partners together to tackle this global issue is critical. We need to bring our knowledge, creativity and expertise together to be smarter about how we can shift mangrove trajectories in a more positive direction globally. As one step toward this effort, WWF and partners have formed a Global Mangrove Alliance for concerted conservation action for global impacts. If mangroves disappeared we would lose a key resource for hundreds of millions of people across the tropics and subtropics. Mangroves provide so many ecosystem services to coastal communities and beyond; fisheries, fuel and timber, medicinal products, coastal protection, and numerous cultural and spiritual services. These would be almost impossible to replace. Luckily, a world without mangroves isn’t something we are going to see any time soon. Global mangrove deforestation rates have declined substantially since the 1980s — we are not losing them as fast as we used to, though there are some countries that still continue to destroy their mangroves rapidly. This is in part due to changes in industries and deforestation drivers (e.g. the intensification of aquaculture) but also because stakeholders and governments are now seeing the real value of mangroves and improving their conservation and restoration. There are many dedicated local communities, researchers, NGOs and government representatives working toward the better protection of this important ecosystem. We are still losing too much mangrove area, but I’m cautiously optimistic. A tiger in the Sundarban Tiger Reserve, India. Image by Soumyajit Nandy via Wikimedia Commons (CC BY-SA 4.0). “If there are no mangroves, then the sea will have no meaning. It’s like a tree with no roots, for the mangroves are the roots of the sea!” — Quote by Mad-Ha Ranwasii, a Thai fisherman and village headman, 1992. Mangroves are the rainforests by the sea. Mangrove forests fringe large stretches of the subtropical and tropical coastlines of Asia, Africa, Oceania and the Americas. Now, less than 15 million hectares (58,000 square miles) remain — less than half the original area. Mangrove forests are vital for healthy coastal ecosystems in many regions of the world. These forest wetlands support an immense array of marine and coastal life, serving as vital fish nurseries, nesting and feeding grounds for migratory birds, last stands for Bengal tigers and lemurs and a wide variety of other mammals including manatees and proboscis monkeys, and a myriad of insects and reptiles, including sea turtles and saltwater crocodiles. Mangroves also support the health and productivity of coral reefs and seagrass beds. In addition, mangroves play an important, life-supporting role for countless traditional coastal communities and indigenous peoples who depend on mangroves for life and livelihoods. Yet mangroves are one of the most threatened habitats on Earth, with an annual loss outpacing other tropical rainforests. Their disappearance is primarily due to clearing for shrimp aquaculture, timber and fuelwood extraction, charcoal production, urban and agriculture expansion, pollution, coastal road construction, and other industrial and infrastructure developments. Cleared forests and degraded wetlands are turned into shrimp ponds, oil ports, tourist hotels, golf courses and marinas. Today, it is imperative to counter these losses. This is one of the challenges taken up by Mangrove Action Project since its founding in 1992. 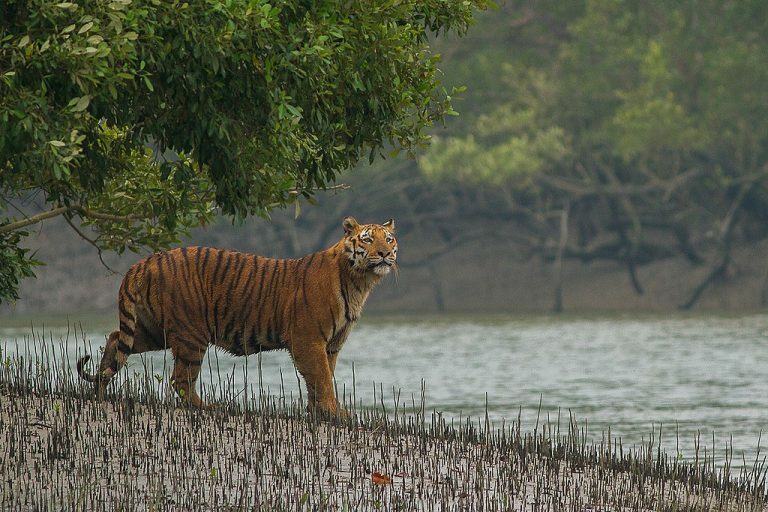 The importance of the protective mangrove buffer zone cannot be overstated. Mangroves are living buffers against the forces of storms and waves that can otherwise devastate a coastline. In regions where these coastal fringe forests have been cleared, tremendous problems of erosion and siltation have arisen, and terrible losses to human life and property have occurred due to destructive hurricanes, storm surges and tsunamis. Today there is a growing urgency to recognize the importance of conserving and restoring protective mangrove greenbelts to lessen the dangers from future catastrophes, because as oceans warm and sea levels rise, so will the frequency and intensity of hurricanes and storm surges. 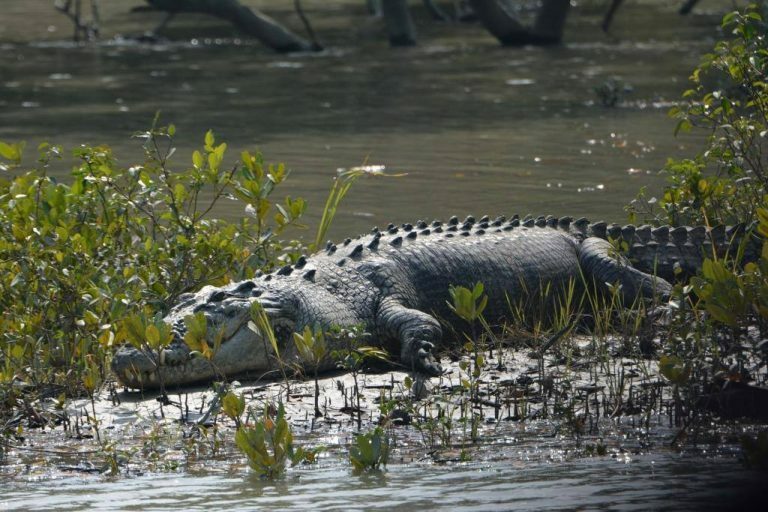 A saltwater crocodile in the Sundarban mangroves, India. Image by Udayan Dasgupta/Mongabay. Mangroves now are also recognized for their important role in combating climate change, sequestering up to five times more carbon than other forest ecosystems, storing that carbon in their peat soils for hundreds, if not thousands of years. Because nearly half of humankind today lives in cities and settlements located along the now more vulnerable coasts, and because many industries such as aquaculture are situated along these same coasts, climate change and consequent sea level rise cannot be ignored. Shrimp aquaculture, which plays a significant role in the so-called “Blue Revolution,” has been and still is one of the greatest threats to mangroves. 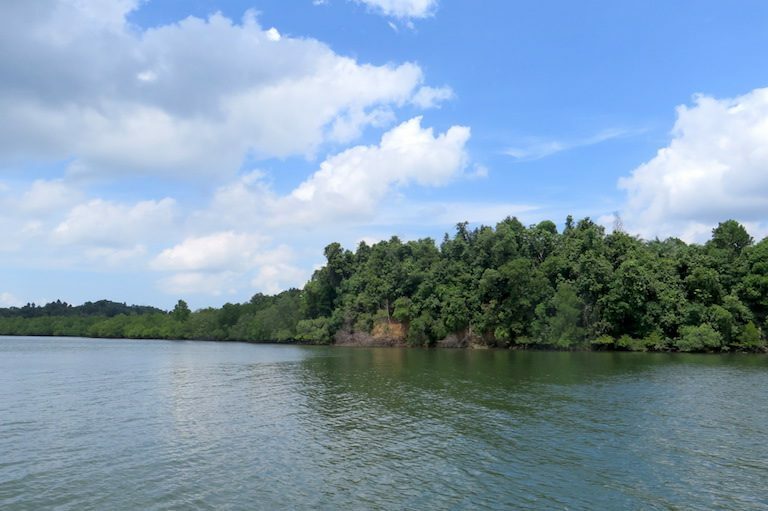 Current examples of such threats can be found today in Malaysia’s Pitas mangroves of Sabah, or the remaining mangrove areas of Honduras, Myanmar and Indonesia, where new shrimp farms continue to encroach upon primary and degraded mangrove wetlands. With the increasing threat of climate change looming over our planet, the ongoing clearing of mangroves for shrimp production, or for whatever other reasons, must now be perceived in an entirely new caution light. Seeking the most effective path toward long-term mangrove conservation and recovery, Mangrove Action Project (MAP) promotes the concept and practice of community-based ecological mangrove restoration (CBEMR). This holistic approach to mangrove restoration views the proposed plant and animal communities to be restored as part of a larger ecosystem, connected with other ecological communities that also have functions to be protected or restored. Mangrove forests can self-repair, or successfully undergo secondary succession, if the normal tidal hydrology is restored and if there is a ready source of mangrove seedlings or propagules from nearby stands that are accessible to reseed an area. CBEMR focuses on re-establishing the hydrology and topography, which will facilitate this natural regeneration process. CBEMR also engages local communities in the restoration process, empowering them to be stewards of their environment, and enabling them to regain the livelihoods ruined when the mangroves were destroyed. Five- to 10-day intensive workshops train local people to do CBEMR, and long-term community management and monitoring plans ensure project sustainability. Many challenges remain, however, such as the need for more robust monitoring and evaluation with internationally recognized outcome indicators. Also, there are challenging issues of land tenure and site availability; restrictions imposed by donors; carbon offset plantings encouraging ecosystem conversion rather than true mangrove restoration; and securing government permits and approvals. Reforestation programs where the mangroves have been lost would therefore aim to re-establish mangrove forest protection, while furthering the potential for sustainable development. The improvement of mangrove ecosystems through restoration will enhance their functions as a natural water treatment system and spawning and nursery grounds for fish and shrimps, thereby improving health and livelihood possibilities to the benefit of marginalized local communities; and restoring the vital carbon sequestration powers of these forests. We at MAP recognize that all of this work cannot be done without involvement of local communities and community-based NGOs working with the cooperation of local government, scientists and educators in this process of conserving and managing their coastal resources. Just as mangroves are the “roots of the sea,” it is hoped that this expanding network of partners and projects will continue to strengthen and spread its roots throughout the world. Editor’s note: Comments have been lightly edited for clarity and style.